Asolo Rep Premieres "Luck Be a Lady: The Iconic Music of Frank Loesser"
A world premiere at Asolo Rep showcases the enduring appeal of Broadway songwriter Frank Loesser. Doughnut lovers will find creative new flavors at La Dona Donuts. Chef Judi scouts a hot dish at Bradenton's Arts and Eats, plus Aloe Organics and what's trending in today's kitchens. The bright, chunky plates and cups decorated with concentric circles are made to be mixed and matched. Carol Tisch scouts a local source for a hot design trend. Go inside a Harbor Acres home that's gotten a sunny, coastal-style update thanks to interior designer Kristin Raybon. Bob Plunket gives us a peek into what the condos in downtown Sarasota's new Sansara building will look like. Our editors' and readers' picks for the best arts and entertainment in Sarasota for 2015. Our editors' and readers' picks for the best shopping Sarasota for 2015. Our editors' and readers pick the best new dining in Sarasota for 2015. Brookings Institution fellow and Sarasota native Adie Tomer on what's driving our current traffic crisis. 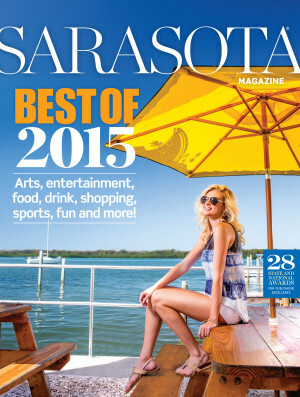 Our editors' and readers' picks for the Best of Sarasota 2015. Pam Daniel asks our editors to choose their personal "bests." Troubleshooter Mr. C signs up for a gun class.